For over 40 years, our family has been making great leather belts, in the small town of High Springs, Florida. We are proudly Made in the USA at the family compound, Sedona Farms. I am an old biker guy who loves to ride my motorcycles, and I love to make belts I know appeal to other biker enthusiasts. My belts are made of 9-10oz heavy top grain cowhide leather. The top grain is stronger and very durable. My belts will wear for years to come. Choose from plain black belts, belts embellished with conchos, embossed designed belts, and personalized name belts. Many steps are involved in the belt making process. After stripping, beveling, designing and airbrushing the belts, finishing steps such as hand painting, antiquing, skiving and snapping are done. At Sedona Farms, life is not only about motorcycles and making leather belts. I often gather at the gazebo by the pond with family & friends to enjoy the fresh air and peaceful country living. 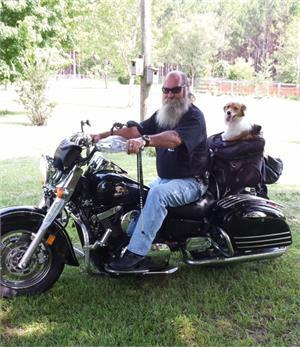 The many creatures we share the land with include, chickens, guineas, ducks, swans, geese, peacocks and my beloved dog "Meadow" whose quite the motorcycle enthusiast also.